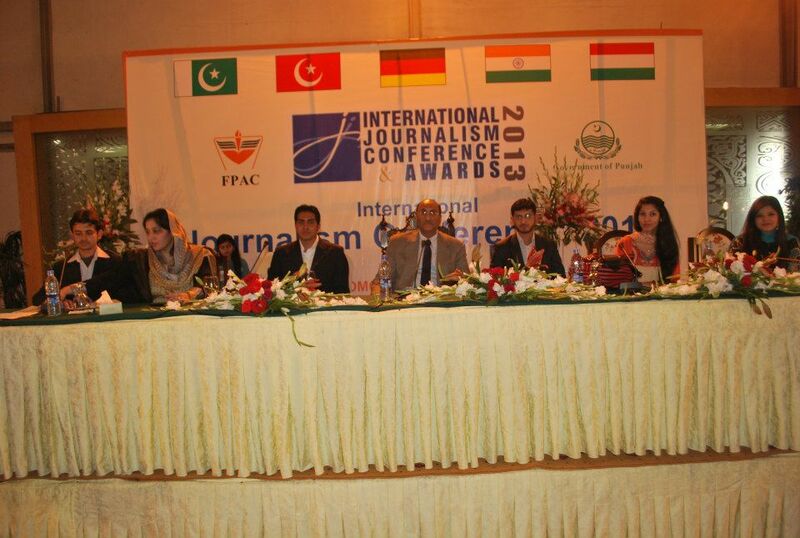 The FPAC (foundation for the promotion of academic collaboration) organised its first IJC (International journalism Conference) starting from the 21st to 23rd of Feb. 2013, the event was co-organized by the government of Punjab & held in PC. The focus of the conference was to talk about the changes Pakistani media has made in contrast to international, its Pro’s & con’s & its future in today’s world. It was attended by Mass Communication students from all over Punjab a well as by students, teachers, and people of other professions. 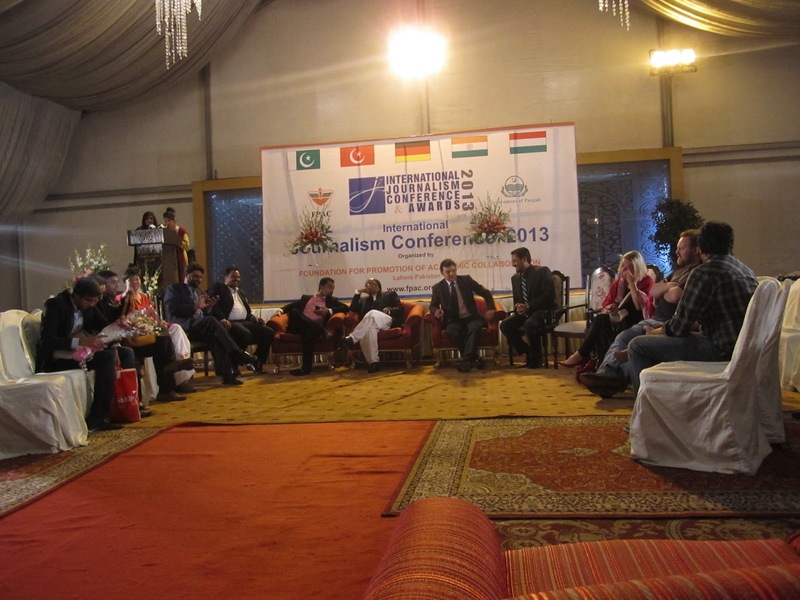 The conference was headed by Amir Rafique & inaugurated by CM Punjab Shahbaz Sharif. The Cm Stated in his speech that Pakistan was in a bad situation & it was the job of the media to show the world its true & pure image. The youth of Pakistan can do this & hence the conference to show how this can be done in a positive manner. The seminar started with Ingrid Mueller’s (a German journalist) presentation on the basics of media, followed by Ameer Hamza’s (A Pakistani working for International Media) speech on the globalisation of Media. He said: “Majority of is owned by selected co-operations, which has reduced diversity & hence opinion making is easy”, Mr Irtaza (anchor of Awam ki Baat, Dawn News) talked about what television was made for & what it has become & said“Truth is the name of journalism” & Next was Dr.Zsuzanna’s (a PHD in nutrition & change maker) energetic session on how to bring about positive change with just a few steps. She asked people to hug anyone ( of the same gender) stand 5 steps from them, this opened up people to teach other,, breaking the ice between them & allowing them to mix with each other better in the later sessions. She said that the drawback of today’s youth is the fear to open up & this fear leads to many problems. 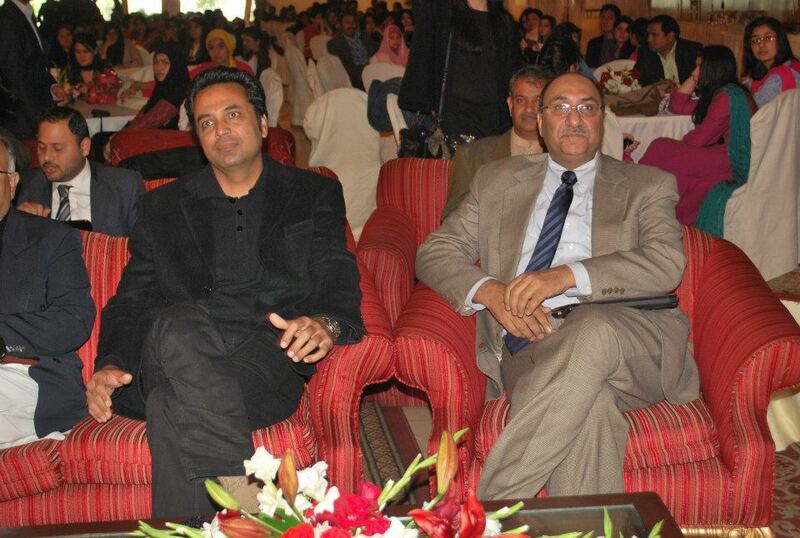 Prof. Dr Ahsan Akhtar Naz, Jawad Hassan & Raza Naeem talked on media ethics & accountability. Prof. Dr Muhghees-ud-din-shekih (Dean of PU media studies Dept), Amna Ashraf, Dr Anjum Zia spoke on Media Education. The audience was at all times given a healthy chance to ask questions, clarify their doubts & to put points forward, criticise & receive convincing answers by the panel. The main purpose of day one was to educate the youth about the media & its working. The day ended with the recording of the show “Awam ki baat” by Irtaza on Dawn News, the topic of the show being journalism. The next day was yet another information filled session; the tent was full of thriving students, the day began with the title Business Journalism, Suhayll Riaz Raja (Dean of Superior University Media Dept.) talked about the Advertising business, Prof; Rizwan Razi ( Teacher at Superior University Media Dept) gave a brief on how Business channels are supposed to be & the PEMRA requirements & then to end the session phenomenally a remarkable presentation by Mr Talhat Hussain on “Media Globalization, Pakistan’s Context” he said that “”Pakistan didn’t need global media to be integrated into the world map” he further presented & elaborated his points saying that the new media was a luxury for the elite. His persona had a great effect on the students; everyone had many questions to be answered & looked on to him as an inspiration. The day commenced with the topic of “Social Media Factor” by Dr Anjum Zia supported Ali Ashraf who presented the interactive model between normal & social media, showcasing how social media allowed an audience to give feedback & interact with its provider which the former didn’t. Farhan Masood (founder of Pakistan Go Green) elaborated the point that how social media can be the cause of changes. Waseem Badami (ARY Anchor) talked about the practical sense of journalism. The last agenda for the day was a round table talk between the students & al the panellist present from both the days & many more journalists, media persons. This session was to voice out the concerns of the current Pakistani media, how to solve them & how the youth will help in its improver. The conference closed with a dinner from the CM to all the participants & for the hope gaining from the knowledge learned in the past days.